Moving time: 4 hr. 36 min. Wind: calm in the morning; 10 mph from South in the afternoon. Today wasn't as hot as yesterday. I started riding at 5:30am which bought me more hours of cool riding than yesterday. About 10:00am it started to get really hot. I rode a lot of hills today and felt like I was on a roller coaster. I also met many, many dogs today. Luckily I was going down hill when I met up with them so I could easily outrun them. I really don't like them chasing after me and riding beside me. Hopefully I won't get tangled up with one. 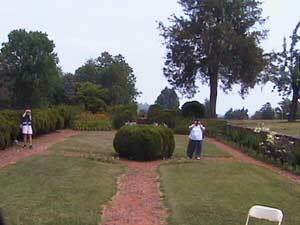 I went to Ash Lawn, home of President James Monroe. The ride up to the home is very steep but passes through rows of huge ash trees that provide shade and let the breeze through. 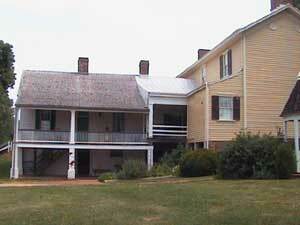 It is a plantation home that Monroe bought in 1793 and moved out of in 1826. William and Mary College now runs the plantation and gives tours. 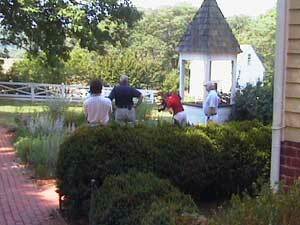 The home is typical of those owned by plantation owners of the time and was expanded after the Monroes moved out. This unique, historic and very well maintained home is larger than the small home Monroe first lived in. Here are pictures of the house and our tour guide. I snuck a photo of this clothes press that Monroe owned at Ash Lawn. It is absolutely huge and very majestic in construction - all mohagany. The picture doesn't do it justice. The other picture is of the HGTV crew who was taping for a show. 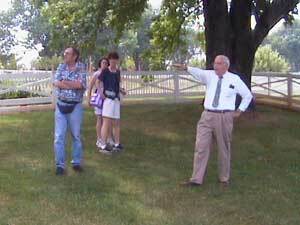 A very unique feature of Ash Lawn is its orientation in relationship to Monticello, the home of Thomas Jefferson. In many ways Monroe was Jefferson's protege. 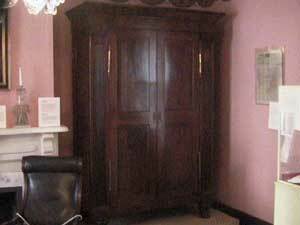 In honor of Jefferson, Monroe created an exit to his home that has a very low ceiling. That way when he exited the home to the courtyard he would be bowing to Jefferson. The first picture is of the courtyard. 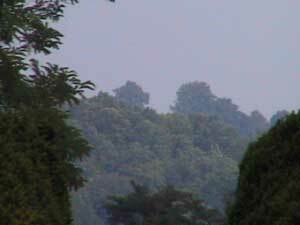 In the distance there are two trees that stand out at Monticello. The second photo is a close up shot of those trees. 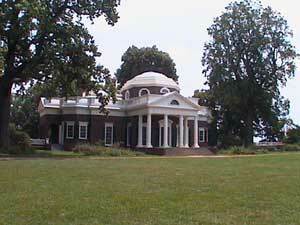 Just north of Ash Lawn is Monticello, the home of Thomas Jefferson. It is far more majestic and very well built. Jefferson thought of everythng in the construction of the home and it has some very, very unique features. Jefferson was a true renaissance man and a nerd to boot. I absolutely recommend that you visit this awesome place! Construction at the entrance to Monticello made riding a little tricky - I had to push my bike through a construction zone located on a steep hill. The fast, long ride down into Charlottesville made up for it. 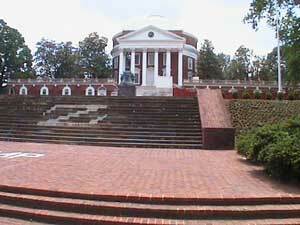 My day ended at about 2:00pm in Charlottesville, home to the University of Virginia. Thomas Jefferson's architectural influence is very apparent in the buildings on campus, particularly the one below which features nearly the same facade as Monticello. Charlottesville is a nice town with all the amenities that a bike tourist could ever want and more. 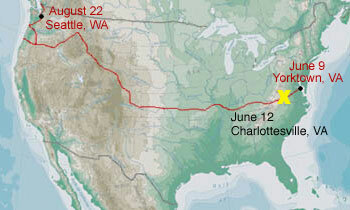 I made reservations at an EconoLodge in advance. I arrived at the hotel to check in and nice woman working the counter me that there was no reservation for me. I showed her my reservation confirmation number and she looked it up in the computer only to find out it was for the EconoLodge up the road. I was embarrassed and a little dismayed to find out that I had further to ride, even though it was just another mile or so. The road these hotels were on was a busy shopping strip and it wasn't too fun making my way up the four lane road with all those cars hurriedly making their way to the mall. I got a shower then hit the chinese restaurant next door to tie on the food bag. Food: Lance sugar cookies (375 Cal. ), 2 oatmeal raisin cookies (360 Cal. ), 2 quarts Gatorade (800 Cal. ), Chicken and Broccoli freeze dried food (270 Cal), beef & broccoli dinner (620 Cal.) with rice (210 Cal), and egg roll (140 Cal.) at Szechuan restaurant, 4.5 quarts water. Total Energy: 2775 Cal.